The initial result of the Big Bang was an intensely hot and energetic liquid that existed for mere microseconds that was around 10 billion degrees Fahrenheit (5.5 billion Celsius). This liquid contained nothing less than the building blocks of all matter. As the universe cooled, the particles decayed or combined giving rise to…well, everything. Scientists like Reed, an assistant professor in Lehigh University’s Department of Physics whose research includes experimental high-energy physics, cannot go back in time to study how the Universe began. So they re-create the circumstances, by colliding heavy ions, such as Gold, at nearly the speed of light, generating an environment that is 100,000 times hotter than the interior of the sun. The collision mimics how quark-gluon plasma became matter after the Big Bang, but in reverse: the heat melts the ions’ protons and neutrons, releasing the quarks and gluons hidden inside them. There are currently only two operational accelerators in the world capable of colliding heavy ions — and only one in the U.S.: Brookhaven National Lab’s Relativistic Heavy Ion Collider (RHIC). It is about a three-hour drive from Lehigh, in Long Island, New York. Reed is part of the STAR Collaboration , an international group of scientists and engineers running experiments on the Solenoidal Tracker at RHIC (STAR). The STAR detector is massive and is actually made up of many detectors. It is as large as a house and weighs 1,200 tons. STAR’s specialty is tracking the thousands of particles produced by each ion collision at RHIC in search of the signatures of quark-gluon plasma. Using the various STAR detectors, the team collides ions at different collision energies. The goal is to map quark-gluon plasma’s phase diagram, or the different points of transition as the material changes under varying pressure and temperature conditions. Mapping quark-gluon plasma’s phase diagram is also mapping the nuclear strong force, otherwise known as Quantum Chromodynamics (QCD), which is the force that holds positively charged protons together. Understanding quark-gluon plasma’s phase diagram, and the location and existence of the phase transition between the plasma and normal matter is of fundamental importance, says Reed. “It’s a unique opportunity to learn how one of the four fundamental forces of nature operates at temperature and energy densities similar to those that existed only microseconds after the Big Bang,” says Reed. The STAR team plans to continue to run experiments and collect data in 2019 and 2020, using the new Event Plan Detector. According to Reed, the new detector is designed to precisely locate where the collision happens and will help characterize the collision, specifically how “head on” it is. “It will also help improve the measurement capabilities of all the other detectors,” says Reed. Lehigh University is an American private research university in Bethlehem, Pennsylvania. It was established in 1865 by businessman Asa Packer. 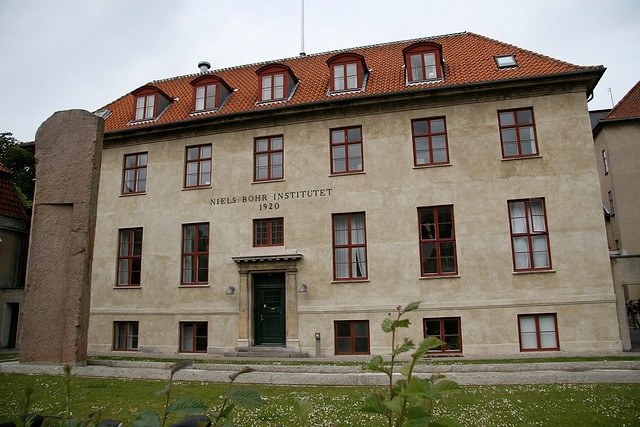 Its undergraduate programs have been coeducational since the 1971–72 academic year. As of 2014, the university had 4,904 undergraduate students and 2,165 graduate students. Lehigh is considered one of the twenty-four Hidden Ivies in the Northeastern United States. Lehigh has four colleges: the P.C. Rossin College of Engineering and Applied Science, the College of Arts and Sciences, the College of Business and Economics, and the College of Education. The College of Arts and Sciences is the largest, which roughly consists of 40% of the university’s students.The university offers a variety of degrees, including Bachelor of Arts, Bachelor of Science, Master of Arts, Master of Science, Master of Business Administration, Master of Engineering, Master of Education, and Doctor of Philosophy. Scientists are searching for the critical point of quark-gluon plasma, the substance that formed just after the Big Bang. Finding where quark-gluon plasma abruptly changes into ordinary matter can reveal new insights. In less than a heartbeat, the universe cooled, “freezing” the lake. Instead of becoming a solid block, everything separated out into clusters of quark “pebbles” connected by gluon “ice.” When some of these quarks joined together, they became our familiar protons and neutrons. After a few minutes, those protons and neutrons came together to form nuclei, which make up the cores of atoms. Quarks and gluons are two of the most basic subatomic particles in existence. Today, quarks make up protons and neutrons while gluons hold the quarks together. But since the Big Bang, quarks and gluons have never appeared by themselves in ordinary matter. They’re always found within protons or neutrons. Except for a few very special places in the world. In facilities supported by the Department of Energy’s (DOE) Office of Science, scientists are crashing gold ions into each other to recreate quark-gluon plasma. 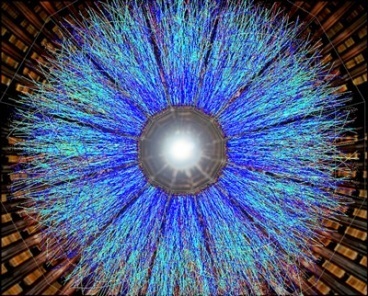 They’re working to map how and when quark-gluon plasma transforms into ordinary matter. Specifically, they’re looking for the critical point – that strange and precise place that marks a change from one type of transition to another between quark-gluon plasma and our familiar protons and neutrons. Because quark-gluon plasma could provide insight into universe’s origins, scientists have wanted to understand it for decades. It could help scientists better comprehend how today’s complex matter arises from the relatively straightforward laws of physics. But scientists weren’t able to study quark-gluon plasma experimentally at high energies until 2000. That’s when researchers at DOE’s Brookhaven National Laboratory flipped the switch on the Relativistic Heavy Ion Collider (RHIC), an Office of Science user facility. This particle accelerator was the first to collide beams of heavy ions (heavy atoms with their electrons stripped off) head-on into each other. It all starts with colliding ions made of protons and neutrons into each other. The bunches of ions smash together and create about a hundred thousand collisions a second. When the nuclei of the ions first collide, quarks and gluons break off and scatter. RHIC’s detectors identify and analyze these particles to help scientists understand what is happening inside the collisions. As the collision reaches temperatures hot enough to melt protons and neutrons, the quark-gluon plasma forms and then expands. When the collisions between nuclei aren’t perfectly head-on, the plasma flows in an elliptical pattern with almost zero resistance. It actually moves 10 billion trillion times fasterExternal link than the most powerful tornado. The quarks in it strongly interact, with many particles constantly bouncing off their many neighbors and passing gluons back and forth. If the universe began in a roiling quark-gluon lake, inside the RHIC is a miniscule but ferocious puddle. Then, everything cools down. The quarks and gluons cluster into protons, neutrons, and other subatomic particles, no longer free. All of this happens in a billionth of a trillionth of a second. After running these experiments for years, scientists at RHIC finally found what they were looking for. The data from billions of collisions gave them enough evidence to declare that they had created quark-gluon plasma. 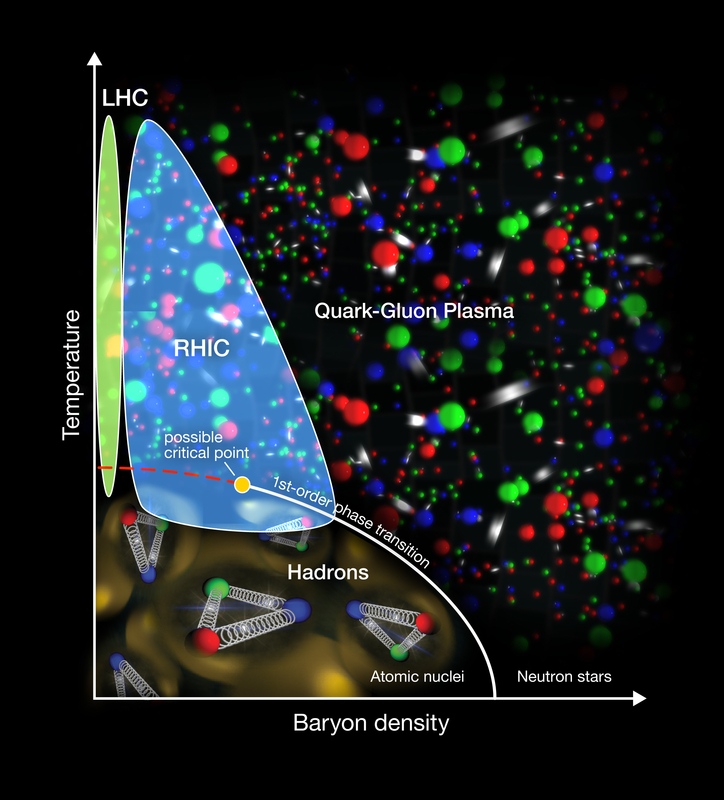 Through temperature measurements, they could definitively say the collisions created by RHIC were hot enough to melt protons and neutrons, breaking apart the quark-gluon clusters into something resembling the plasma at the very start of the universe. Since then, scientists at the Large Hadron Collider at CERN in Geneva have also produced quark-gluon plasma. Researchers at both facilities are working to better understand this strange form of matter and its phases. 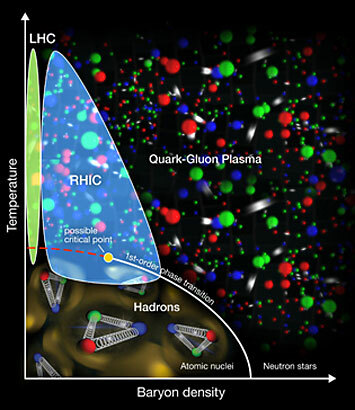 This diagram plots out what scientists theorize about quark-gluon plasma’s phases using the Relativistic Heavy Ion Collider (RHIC) and the Large Hadron Collider (LHC). Baryon density is the density of the particles in the matter. All matter has different phases. A phase is a form where matter has consistent physical properties, such as density, magnetism, and electrical conductivity. The best-known phases are solid, liquid, and gas. For example, water’s conventional phases are ice, liquid water, and steam. Beyond the phases familiar to us, there’s also the plasma phase that makes up stars and the utterly unique quark-gluon plasma. Phase transitions, where materials move between phases, reveal a great deal about how matter functions. Materials usually change phases because they experience a change in temperature or pressure. Like many types of matter, quark-gluon plasma goes through phase transitions. But because quarks and gluons haven’t existed freely in ordinary matter since the dawn of time, it acts differently than what we’re used to. In most circumstances, matter goes through first-order phase transitions. These changes result in major shifts in density, such as from liquid water to ice. These transitions also use or release a lot of heat. Water freezing into ice releases energy; ice melting into water absorbs energy. But quark-gluon plasma is different. In quark-gluon plasma, scientists haven’t seen the first-order phase transition. They’ve only seen what they call smooth or continuous cross-over transformations. In this state, gluons move back and forth smoothly between being free and trapped in protons and neutrons. Their properties are changing so often that it’s difficult to distinguish between the plasma and the cloud of ordinary matter. This phase can also happen in ordinary matter, but usually under extreme circumstances. For example, if you boil water at 217 times the pressure of our atmosphere, it’s nearly impossible to tell the difference between the steam and liquid. Even though scientists haven’t seen the first-order phase transition yet, the physics theory that describes quark-gluon plasma predicts there should be one. The theory also predicts a particular critical point, where the first-order phase transition ends. “This is really the landmark that we’re looking for,” said Krishna Rajagopal, a theoretical physicist and professor at the Massachusetts Institute of Technology (MIT). Understanding the relationships between these phases could provide insight into phenomena beyond quark-gluon plasma. In fact, scientists have applied what they’ve learned from studying quark-gluon plasma to better understand superconductors. Scientists can also use this knowledge to understand other places where plasma may occur in the universe, such as stars. These collisions have allowed scientists to sketch out the basics of quark-gluon plasma’s phases. So far, they’ve seen that ordinary matter occurs at the temperatures and densities that we find in most of the universe. In contrast, quark-gluon plasma occurs at extraordinarily high temperatures and densities. While scientists haven’t been able to produce the right conditions, theory predicts that quark-gluon plasma or an even more exotic form of matter may occur at low temperatures with very high densities. These conditions could occur in neutron stars, which weigh 10 billion tons per cubic inch. Delving deeper into these phases will require physicists to draw from both theory and experimental data. Theoretical physics predicts the critical point exists somewhere under conditions that are at lower temperatures and higher densities than RHIC can currently reach. But scientists can’t use theory alone to predict the exact temperature and density where it would occur. What theory can do is provide hints as to what to look for in experiments. Some collisions near the critical point should produce first-order transitions, while others produce smooth cross-over ones. Because each type of phase transition produces different types and numbers of particles, the collisions should, too. As a result, scientists should see large variations in the numbers and types of particles created from collision to collision near the critical point. There may also be big fluctuations in electric charge and other types of phenomena. The only way to see these transitions is to collide particles at a wide range of energies. RHIC is the only machine in the world that can do this. While the Large Hadron Collider can produce quark-gluon plasma, it can’t collide heavy ions at low enough energy levels to find the critical point. So far, scientists have done an initial “energy scan” where they have run RHIC at a number of different energy levels. However, RHIC’s current capabilities limit the data they’ve been able to collect. 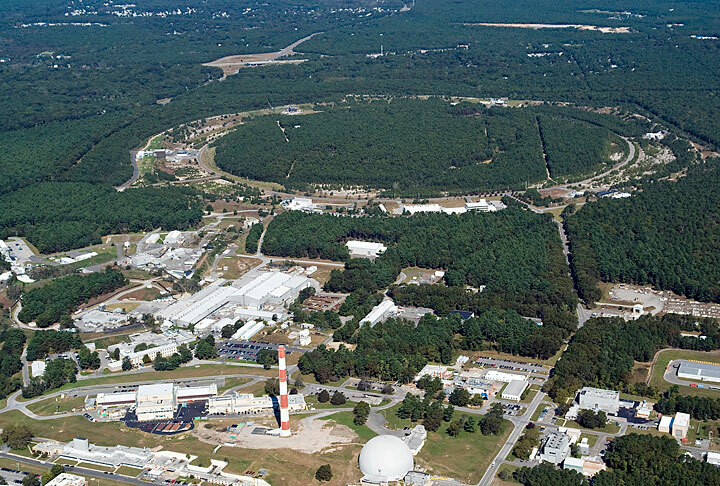 “We had some very intriguing results, but nothing that was so statistically significant that you could declare victory,” said Rosi Reed, a Lehigh University assistant professor who conducts research at RHIC. RHIC is undergoing upgrades to its detector that will vastly increase the number of collisions scientists can study. It will also improve how accurately they can study them. When RHIC relaunches, scientists envision these hints turning into more definitive answers. From milliseconds after the Big Bang until now, the blazing lake of quark-gluon plasma has only existed for the smallest fraction of time. But it’s had an outsized influence on everything we see. 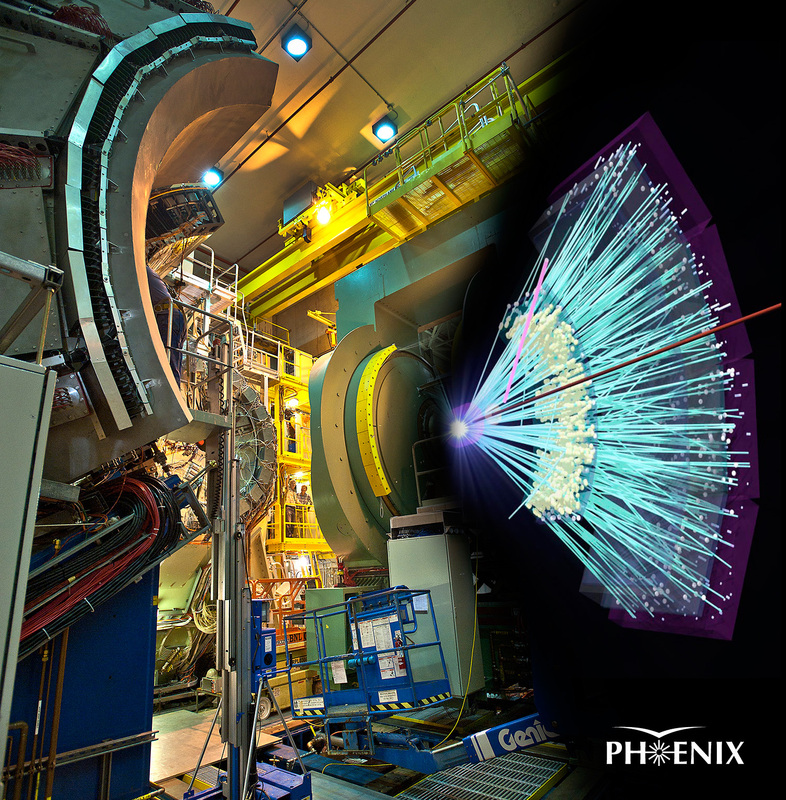 The PHENIX detector at the Relativistic Heavy Ion Collider (RHIC) with a superimposed image of reconstructed particle tracks picked up by the detector. Particles emerging from even the lowest energy collisions of small deuterons with large heavy nuclei at the Relativistic Heavy Ion Collider (RHIC)—a U.S. Department of Energy Office of Science User Facility for nuclear physics research at DOE’s Brookhaven National Laboratory—exhibit behavior scientists associate with the formation of a soup of quarks and gluons, the fundamental building blocks of nearly all visible matter. These results from RHIC’s PHENIX experiment suggest that these small-scale collisions might be producing tiny, short-lived specks of matter that mimics what the early universe was like nearly 14 billion years ago, just after the Big Bang. Scientists built RHIC, in large part, to create this “quark-gluon plasma” (QGP) so they could study its properties and learn how Nature’s strongest force brings quarks and gluons together to form the protons, neutrons, and atoms that make up the visible universe today. But they initially expected to see signs of QGP only in highly energetic collisions of two heavy ions such as gold. The new findings—correlations in the way particles emerge from the collisions that are consistent with what physicists have observed in the more energetic large-ion collisions—add to a growing body of evidence from RHIC and Europe’s Large Hadron Collider (LHC) that QGP may be created in smaller systems as well. The PHENIX collaboration has submitted the findings in two separate papers to the journals Physical Review Letters and Physical Review C, and will present these results at a meeting in Krakow, Poland this week. “These are the first papers that come out of the 2016 deuteron-gold collisions, and this is one indication that we are probably creating QGP in small systems,” said Julia Velkovska, a deputy spokesperson for PHENIX from Vanderbilt University. “But there are other things that we have seen in the larger systems that we have yet to investigate in this new data. We’ll be looking for other evidence of QGP in the small systems using different ways to study the properties of the system we are creating,” she said. One of the earliest signs that RHIC’s collisions of two gold ions were creating QGP came in the form of “collective flow” of particles. More particles emerged from the “equator” of two semi-overlapping colliding ions than perpendicular to the collision direction. This elliptical flow pattern, scientists believe, is caused by interactions of the particles with the nearly “perfect”—meaning free-flowing—liquid-like QGP created in the collisions. Since then, collisions of smaller particles with heavy ions have resulted in similar flow patterns at both RHIC and the LHC, albeit on a smaller scale. There has also been evidence that flow patterns have a strong relationship with the geometrical shape of the projectile particle that is colliding with the larger nucleus. In other words, they wanted to see if they could turn the creation of QGP off. Over a period of about five weeks in 2016, the PHENIX team explored collisions of deuterons (made of one proton and one neutron) with gold ions at four different energies (200, 62.4, 39, and 19.6 billion electron volts, or GeV). “Thanks to the versatility of RHIC and the ability of the staff in Brookhaven’s Collider-Accelerator Department to quickly switch and tune the machine for different collision energies, PHENIX was able to record more than 1.5 billion collisions in this short period of time,” Velkovska said. 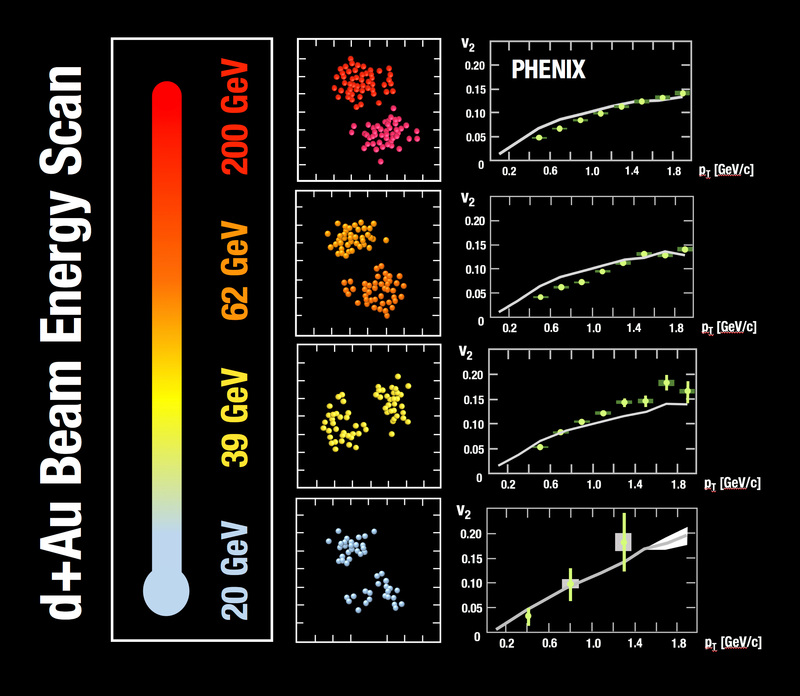 For each collision energy in the beam energy scan, the central panel shows an early-time snapshot of the coordinates of quarks emerging from a deuteron-gold (d-Au) collision as simulated in a transport-model theory calculation. The right panel shows the elliptic flow of the final-state hadrons as measured by PHENIX (closed points), along with the prediction from the theory (solid curve). No image credit. For the paper submitted to PRC, Darren McGlinchey, a PHENIX collaborator from Los Alamos National Laboratory, led an analysis of how particles emerged along the elliptical plane of the collisions as a function of their momentum, how central (fully overlapping) the collisions were, and how many particles were produced. “Using a deuteron projectile produces a highly elliptical shape, and we observed a persistence of that initial geometry in the particles we detect, even at low energy,” McGlinchey said. Such shape persistence could be caused by interaction with a QGP created in these collisions. “This result is not sufficient evidence to declare that QGP exists, but it is a piece of mounting evidence for it,” he said. Ron Belmont, a PHENIX collaborator from the University of Colorado, led an analysis of how the flow patterns of multiple particles (two and four particles at each energy and six at the highest energy) were correlated. Those results were submitted to PRL. “We found a very similar pattern in both two- and four-particle correlations for all the different energies, and in six-particle correlations at the highest energy as well,” Belmont said. “Both results are consistent that particle flow is observed down to lowest energy. So the two papers work together to paint a nice picture,” he added. There are other possible explanations for the findings, including the postulated existence of another form of matter known as color glass condensate that is thought to be dominated by the presence of gluons within the heart of all visible matter. “To distinguish color glass condensate from QGP, we need more detailed theoretical descriptions of what these things look like,” Belmont said. Velkovska noted that many new students have been recruited to continue the analysis of existing data from the PHENIX experiment, which stopped taking data after the 2016 run to make way for a revamped detector known as sPHENIX. “There is a lot more to come from PHENIX,” she said.